Your home is a natural extension of you. Add these innovative designs to spruce up any decor. 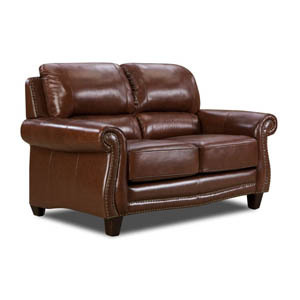 Material: Top Grain and Bonded Eight Way Hand Tied Seating Spring Down Pocketed Coil Seat Cushions Dacron Wrapped Cushions Padded Outside Arm and Back Super Soft Hand Rubber Leather Finish: Brown Dimensions: 65in. x 37in. x 41in.